New Delhi: World Health Organisation (WHO) Wednesday said Dr Poonam Khetrapal Singh has been nominated for a second five-year term as regional director of its South-East Asian Region. Singh’s candidature was unopposed, as the 11 member countries of WHO South-East Asia Region met at the ongoing Regional Committee session to elect the next Regional Director, the global health body said in a statement. Later the WHO statement quoted Nadda as saying,”With her (Singh’s) contribution to regional as well as global initiatives and outstanding work in placing health central to the agenda of sustainable development, she will surely lead the Region to greater heights. The WHO Executive Board, which next meets in Geneva in January 2019, is expected to confirm Singh’s nomination and appoint her as the Regional Director. Singh will commence her next five-year term on February 1, 2019. “As the first woman to become Regional Director of WHO South-East Asia Region, you have provided dynamic leadership in a Region that accounts for one-quarter of the world’s population, but a disproportionate burden of its diseases,” WHO Director-General, Dr Tedros Adhanom Ghebreyesus, was quoted as saying in the statement. The Director-General said that through her flagship programmes, Singh had brought a strong focus to delivering results in countries, which is one of the key themes of WHO’s new General Programme of Work and of WHO’s transformation project. 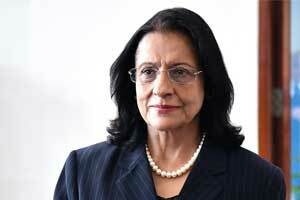 Singh’s ongoing first term as Regional Director began on February 1, 2014, during which, in consultation with the member countries, she identified seven flagship priorities. They include achieving universal health coverage, strengthening emergency response capacity, reversing the noncommunicable disease epidemics, finishing off neglected tropical diseases, combatting antimicrobial resistance, preventing maternal, under-5 and neonatal deaths and eliminating measles and controlling rubella. Eliminating tuberculosis was added as her eighth flagship in 2017, the statement said. Thanking the member States for nominating her for the second term, Singh said, “My vision is to consolidate, accelerate and innovate to further strengthen progress in the priority areas and translate vision into action. Singh has had a four-decade long career in public health. She served in the health sector in various senior positions during her stint in the Indian Administrative Services and in the World Bank. She also worked in WHO Director-General’s cabinet in Geneva, as the Executive Director of Sustainable Development and Healthy Environments in WHO headquarters and was Deputy Regional Director WHO South-East Asia Region from 2000-2013.